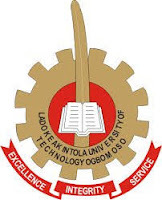 The management of the Ladoke Akintola University of Technology (LAUTECH), Ogbomoso, has released the screening schedule for fresh applicants into the B.Sc. Degree Programme of Directorate of Part-Time Programme for the 2017/2018 academic session. The screening exercise for fresh applicants into the B.Sc. Degree Programme of Directorate of Part-Time Programme comes up between Tuesday, February 20, and Wednesday, February 21, 2018. The venue is the Directorate office at 9:00 a.m each day. All applicants are to come with a copy of their online application form print-out, original and photocopies of all their credentials.